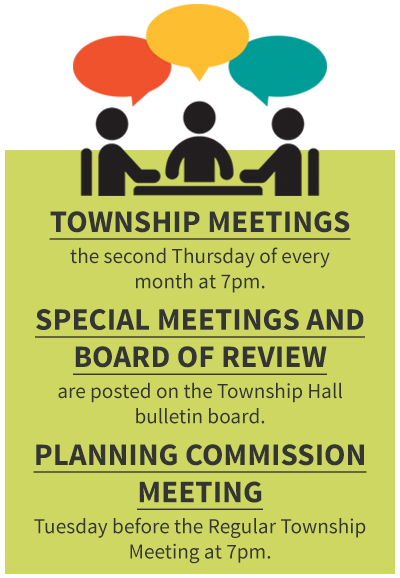 The township has been busy this summer with many improvements. We took over ownership of the Donaldson Cemetery at M129 and 13 Mile Road. We are doing a complete listing of the graves in the new part; the northwest side of 13 Mile Road. This is a big job. We will be working on the old part; the southwest side of 13 Mile Road in the future. The parking lot at the township hall was enlarged with gravel to help with parking and snow removal. About four miles of south Scenic Drive from 15 Mile Road south to Conley Point Boat Launch has new blacktop and shoulder gravel. Due to the high water in the St. Mary’s River we placed rock around the shoreline at Dunbar Park to prevent further erosion. There is a new bridge at the South Branch of the Charlotte River on West 12 Mile Road. It is constructed with pre-casted concrete pieces. UP Pipe in Escanaba and the county workers installed the bridge.